The holiday season is here! Don't you love it when you attend a holiday party and are surprised with good food? I always hope that my guests are excited about the food that we serve. However, sometimes it's hard to find time to prepare food for parties on top of working and taking care of my children. I count on trendy restaurants to help me out. Over the next couple of weeks, we will feature our favorite restaurants that make it easy to host holiday parties. We'll cover four different types of popular holiday menus, including Brazilian, Mediterranean, Texas BBQ, and Low Calorie (Salads). 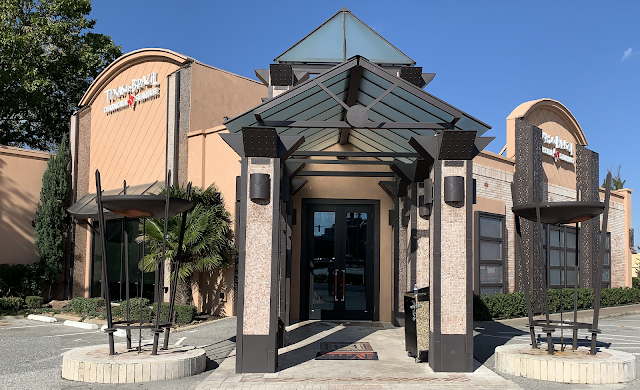 In today's post, we'll feature Texas de Brazil. We took photos in the restaurant, but we'll also tell you about their take-out options for holiday parties. We visited Texas de Brazil in Addison earlier today. The restaurant includes a bar, dining area, take-out, and catering. Starting with the bar, they offer fantastic house wine, beer, Caipirinha, and many other drinks. The buffet is my favorite part because it is generously packed with veggies, fruit, cheese, and, yes, even some meat. Here is a sample plate of food from the buffet area. You'll notice that I love colorful veggies and that the buffet makes it easy to pack a variety of nutrients into a meal. Many of the buffet items are available for $10 to $16 per pound for holiday parties. Click here for a list. 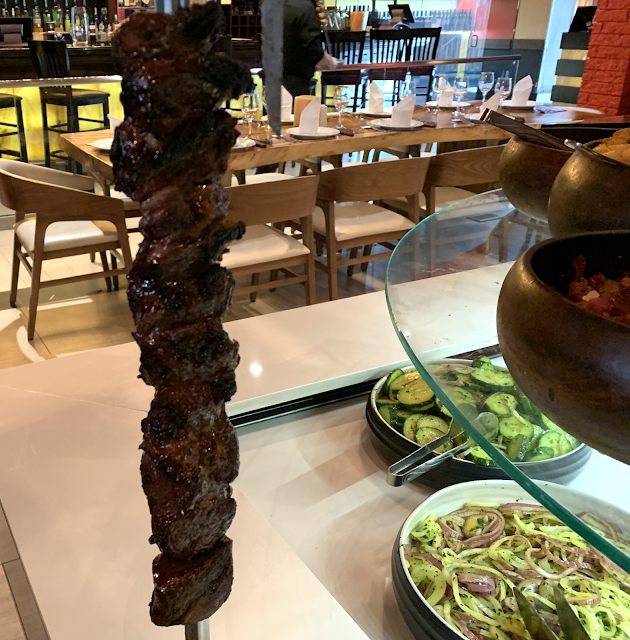 Of course, the main attraction of Texas de Brazil is the rodizio-style dinner. The restaurant is set up nicely that you are able to walk over and watch the chefs prepare the meat. Let me share a few examples. This one is from the kitchen. The following is an example that was brought to our table. Here is another example that was brought to our table. Everything that we tried was fantastic. They were generous with the servings, always asking if we wanted more. The different meats are available for takeout at $8 to $24 per pound for holiday parties. You'll find the full list here. Of course, I should mention the popular dishes that are served to every table, including Brazilian Cheese Bread, Fried Bananas, and Garlic Mashed Potatoes. They are also available for takeout to serve at holiday parties. The Brazilian Cheese Bread is my favorite. The takeout price for this trendy appetizer is $15 per dozen. The Fried Bananas are also popular. The takeout price is $6 per pound. The Garlic Mashed Potatoes are a fantastic complement to meat. The takeout price is $5.75 per pound. Finally, Texas de Brazil is well known for their trendy desserts. The menu and prices may vary by location, so inquire about the options and prices when you call in advance for takeout. (Click here to find the phone number for the location near you.) Here are a few examples from the Addison location. In addition to their regular menu shown above, they currently have a Pumpkin Praline Cheesecake that is fantastic for holiday parties. Again, you will want to call in advance to check the availability and prices for your holiday party. Now that I've shared a variety of menu items, let me point you to their takeout and catering menus. Takeout orders are easy to order in advance and pickup just before your party. Catering is available when you have a minimum of 45 guests (or a $2,000 minimum). I hope that you enjoyed this glimpse into Texas de Brazil. Their food is sure to impress holiday guests. Plus, if you plan in advance, you'll be able to save with their limited time gift card deal. Now through December 21st, customers will receive a $25 bonus card with every $100 gift card purchase. Get the full details here.